At Economic Development Winnipeg, our goal is to be the Winnipeg experts. We love to tell the Winnipeg story and share some of the reasons our city is so great. One of the main ways we present this information is through our website, edwinnipeg.com. Our website is an online destination for those looking for information about our city, its economy and its competitive advantages. For many years, our website has been a hub of detailed information for businesses and residents alike, and we want to ensure we provide the best possible experience for our site visitors. Top of mind for EDW was ensuring the website offers a modern navigating experience, both in terms of the user experience and the way we display content. We wanted to ensure site visitors can easily and quickly find relevant information. That’s why we have undertaken a refresh of our site, which we are pleased to announce is now complete and ready to be revealed. Our new website has several new features, all of which will streamline the user experience. Developing a mobile-first website was a priority for the EDW team, as we know more people are surfing the web on mobile devices than desktops. To meet this demand, mobile functionality has been improved with even easier navigation. The information and content on the site has also been updated, to make sure we are providing the most current economic figures and statistics. Regular visitors to our website might already be familiar with our EDW blog, a recently-launched new blog focusing on Winnipeg-specific business development and success stories. We have made the blog more prominent on our homepage, and will continue to push out new information on this platform. Feel free to also subscribe to our newsletter if you want to receive all the latest content as it happens. Our YES! Winnipeg team, which leads EDW’s sales and business development initiatives, are more broadly highlighted throughout the site. This prominence provides an information platform for YES! Winnipeg, whose goal is to retain, attract, and invest new jobs and capital investment to our city. To help accomplish this goal, the business development portion of the site is displayed much more publicly on the new homepage. Our YES! 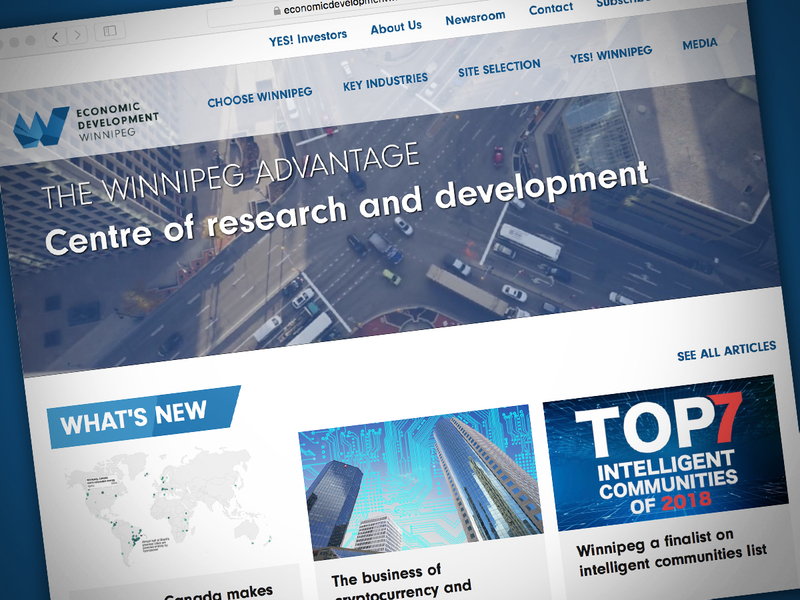 Winnipeg investors are also now being featured more prominently on the homepage, highlighting some of our existing success stories. Our report builder section, which has long been popular with site selectors, has been carried over to the new website. This feature allows site users to save information from a page on the go and take it with them in a handy, self-populating document. Finally, we’ve committed to ensuring our site is fully accessible for the visually impaired, meeting W3C AA standards. Our desktop site can be viewed in mobile mode by shrinking the Internet window screen, which can help with text readability. The site continues to be easily readable by text-to-voice software. While these changes have helped improve the website’s navigation experience, we are not finished yet. We will continue to upgrade our website in the coming months with new information, especially around our competitive sectors. If you have any feedback about our site, we’d love to hear your comments. We look forward to rolling out more improvements in the coming months on our website, and welcome any ideas you might have on how we could make your EDW browsing experience better.